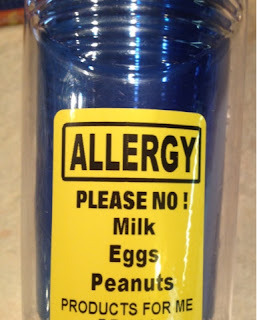 It can be difficult to make sure everyone is aware of your child's food allergy. 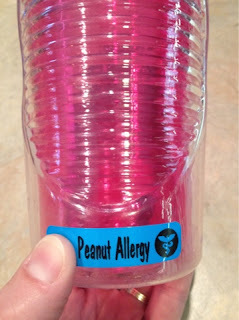 As a food allergy momma, I do lots of worrying, especially when I am not around. I feel much better if my child is "labeled" in some way so others can easily recognize my child's food needs (so they don't feed my monkey). I found these labels from Label It or Lose It that are fantastic! They make specific food allergy warning labels as well as a variety of other labels. They are even dishwasher safe! I ordered the allergy warning labels for Bubs and the regular stick-on labels for GirlyGirl. What a great way to send the message that your child has a food allergy! The kids love these stickers. GirlyGirl wants to wear them on her shirt every time she goes to a party. So cute! I would definitely recommend Label It or Lose It as an easy and fun way to communicate your child's needs.